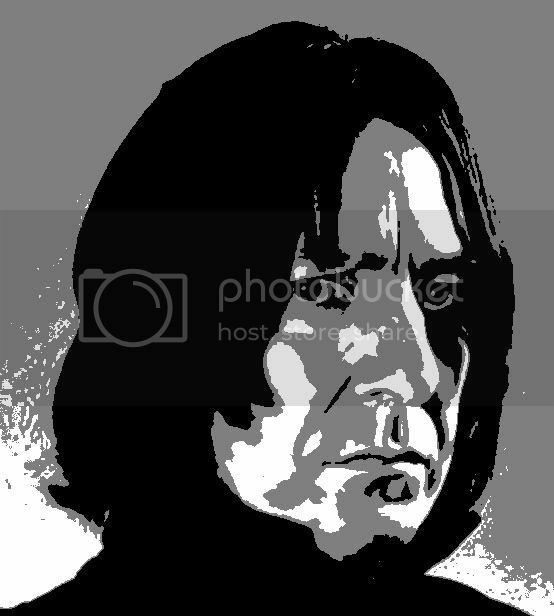 In honor of the release of the final Harry Potter book this year I decided to carve Professor Severus Snape (as portrayed by Alan Rickman). Last year I did a Jack Sparrow Pumpkin. I think this year's is a bit better. One reason may be that I followed some online instructions on how to make a pattern with Photoshop (instead of making up my own by hand). Another reason may be that I used a Funkin (an artificial carvable pumpkin) instead of a real pumpkin. The carving wasn't really any easier, especially since the "flesh" of the Funkin was thick, hard foam. To get the intermediate shade (orange), I had to cut open the back of the pumpkin and spend several hours with a Dremel tool to make the "flesh" thin enough for light to shine through. Despite the extra work, I think the Funkin gives a cleaner result and best of all it doesn't rot! I am a huge fan of Alan Rickman. 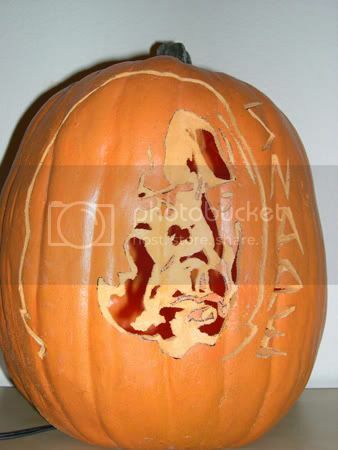 I will definetly try to do this pumpkin. Awesome job!!! I am a HUGE fan of Harry potter series and really want to do a HP pumpkin this year. 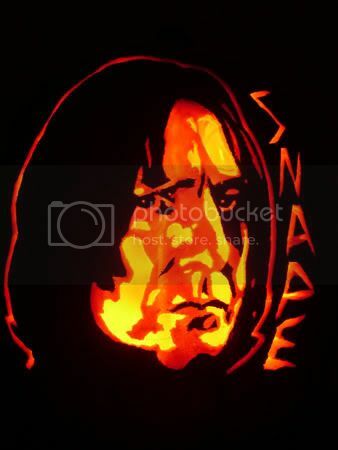 I have not seen a HP / Snape pumpkin as good as yours.. Kudos to you..What an awesome job! You are really v talented..
Sure. The image is here. Enlarge when you print it so it's the right size for your pumpkin. White is cut completely through the pumpkin, grey is where the skin is removed and the flesh thinned enough for light to shine through, and black is uncut. Obviously ignore the colors in the background; to do his hair, just carve a line around the edges (see my pumpkin as an example). Hope this helps. I'd love to see a finished picture of your pumpkin!